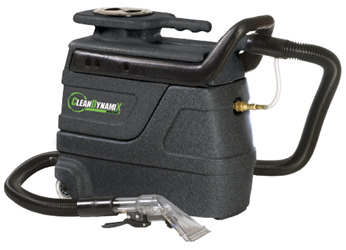 Clean Dynamix HEATED Spot Extractor offers fast, efficient spot cleaning of carpets, rugs and upholstery. Lightweight and great for small upholstery and spot cleaning jobs. A durable 55 PSI pump delivers extracting solution into the carpet. The 2-stage Ametek 804 Watt / 100 CFM vacuum motor efficiently recovers spent solution and soils which allows for faster carpet drying. Includes a smooth-glide slide-out, molded carrying handle and double ball-bearing urethane wheels for easy machine transport. Roto-molded polyethylene body withstands the toughest working environments and resist dents, chips and cracks. Includes (1) 20-Foot, 16/3-gauge safety power cord.